With the new vSphere 4.1 out, not only does a new VMware monitoring solution has to be fully compatible with vSphere 4.1, it should also make use of the new performance data that is available in the vSphere API. 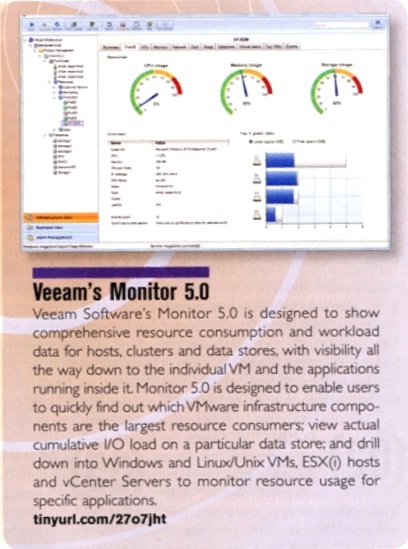 Your VMware monitor should be able to use the new data to monitor NFS storage, storage paths and storage adapters, virtual disks, and power usage of ESX(i) hosts. Built-in intelligence: Over 125 predefined alarms and a knowledge base that explains each alarm and provides possible causes, best practices, suggested resolutions and outside sources of additional information if needed. A new summary dashboard is available for each object in the infrastructure tree, providing an at-a-glance view of the most useful information for any object. One of the things that our customers like about Veeam Monitor is the intuitive UI that allows for quick drilldown into specific performance issues and helps find the cause. Logical disk space monitoring, snapshot monitoring, management reports, streamlined alarm management, scalability and architecture improvements, and UI enhancements have also been improved.